Baptism kit for boys, colorful, with intense color contrasts will make your little baptism impress. 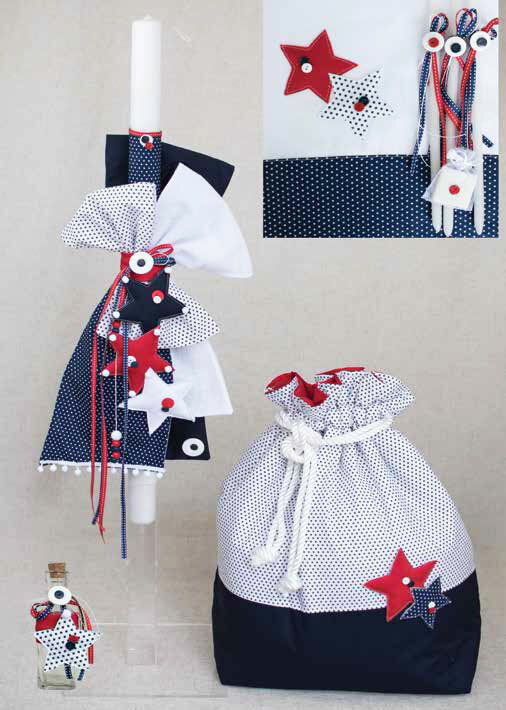 The stars that decorate the whole set are in white red and blue and hang with red and blue ribbons on the candle that are beautifully tied to fabrics that make big bows. The set comes complete with a large purse bag, in dark blue and white cloth, embroidered with star and white string. The set includes: candle, big purse bag, three candles, soap, bottle of oil, laurels, underwear and towels. https://www.preciousandpretty.com/2018/07/stars-baptismal-set-for-boy-E823.html Greek Wedding Favors|Orthodox Crowns|Stefana|Baptism Invitations Stars baptismal set for boy E823 Baptismal set for boys, with colorful stars. Product #: Greek Wedding Favors|Orthodox Crowns|Stefana|Baptism Invitations_3469730048276974845 5 stars out of 5 reviews.